The Franklin College of Arts and Sciences is the oldest, largest and most academically diverse college at the University of Georgia. 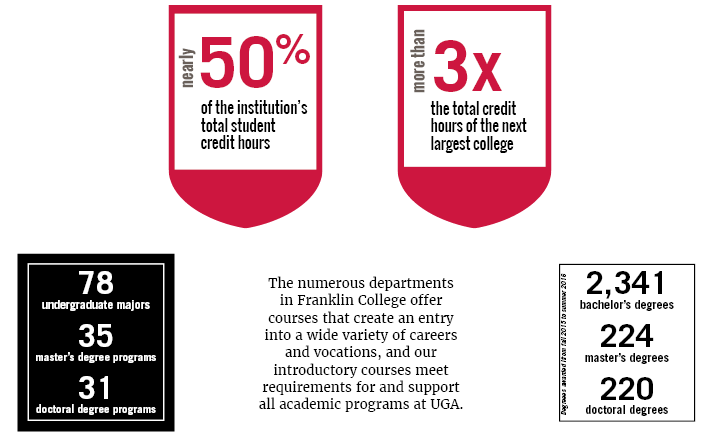 In many ways, it is at the heart of UGA, the nation’s first state-chartered institution of higher education. The first classes were taught in 1801 in a forest clearing on what is now the University’s historic North Campus. 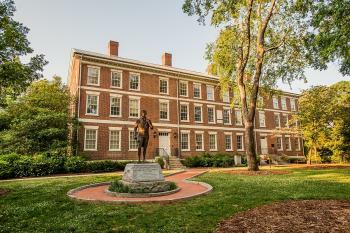 In 1806, the first permanent brick building was constructed on campus and named Franklin College in honor of Benjamin Franklin. The building, which was later renamed Old College, is the oldest structure in Athens and houses the administrative offices of the Franklin College of Arts and Sciences as well as classroom space. Franklin College and University of Georgia were often used interchangeably to describe the fledgling institution until 1859, when the College of Law became the second college on a campus that now boasts 16 schools and colleges.